Japanese soldiers in formation. Image source: United States National Archives. Colorized courtesy of Algorithmia. ⚬ “During the night of December 31, 1944, some twenty persons including some boys were caught in a surprise raid. They were taken to the Japanese Army camps. Only a few managed to escape. The rest were killed. The document is just one of many archived at the National Library of the Philippines as “Historical Data,” solicited from Department of Education districts around the Philippines in 1951 to help reconstruct local histories destroyed during World War II. These “histories” are not entirely reliable because the stories were pieced together mostly from interviews of local folks; and memory, of dates in particular, can be very unreliable. What these “historical data” provide are starting points for further research. “by a patrol of Japanese soldiers and other Filipino followers and on that occasion apprehended fifteen persons and brought them to barrio Mataas-na-Kahoy4 of the same municipality. The 19 February raid was not mentioned in the Supreme Court decision; but there was another incident that was. 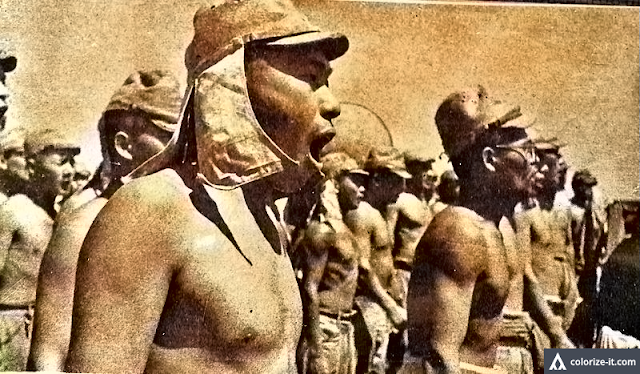 On 27 February, Japanese soldiers returned to barrio Cumba with the intent of flushing out guerrillas from among the barrio folks. On mere suspicion that the residents of certain houses were clandestinely members of the guerrilla movements, the Japanese soldiers and their Filipino followers, including Gonzales, burned down these houses. Readers need to understand that by the end of February 1945, Japanese soldiers in Batangas had started to get really fidgety. For one, the Japanese Imperial Army was staring defeat in the eye in Manila at the hands of the United States Sixth Army, which landed on the shores of Lingayen in January and raced south to liberate the capital from Japanese occupation. Secondly, the United States Eighth Army landed on the beaches of Nasugbu almost a month before and it was a matter of time before the operations to liberate Batangas were to commence. ⚬ While thirteen of the fifteen people who were apprehended from Barrio Cumba and then taken to Mataasnakahoy on New Year’s Eve 1944 were in most likelihood killed because they were never again seen, there was no evidence to indicate that Gonzales had actively participated in the killing. 1 “History and Cultural Life of the Barrio of Cumba,” online at the National Library of the Philippines Digital Collections. 2 Most of the details of this article were taken from “People of the Philippines vs Leandro Gonzales,” online at the LawPhil Project. 4 The reference to Mataasnakahoy as a “barrio” is, of course, erroneous. It formally separated from Lipa in 1932 to be a distinct municipality. “Mataasnakahoy, Batangas,” Wikipedia.